I've been known to exaggerate or flat-out make up stories time to time, but this one, I swear, is true: Back in college, between my junior and senior year, I worked with this one guy whose name I cannot remember, but he was rather, well, unique. Whenever he spoke (which was quite often), he spoke in this rich, silky, charming British accent that even made me swoon a little bit. The ladies loved it. So, one night when we were finishing a shift up, it was absolutely jarring and disorienting to hear him speak....with no accent at all. I think I just stared him stupidly, all wide-mouthed and whatnot, as he caught my expression and said, "Yeah, I actually grew up like 20 minutes away from here. I use an accent because the chicks dig it...it makes me sound mysterious and interesting." I asked him how well that was working out for him. He winked as he flipped his accent back on and said "Very well." That was the only time I ever heard him break character. 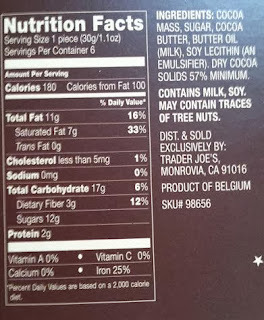 I kinda thought about that guy as I reflected upon the consumption of the Trader Joe's Dark Chocolate Bar. It comes down to appearance management, to make oneself seemingly different from the "ordinary," even when the "ordinary isn't even necessarily a bad thing. There's nothing wrong with a guy from Port Matilda as is, nor anything wrong with a typical candy bar. But let's embellish it a bit. See here. 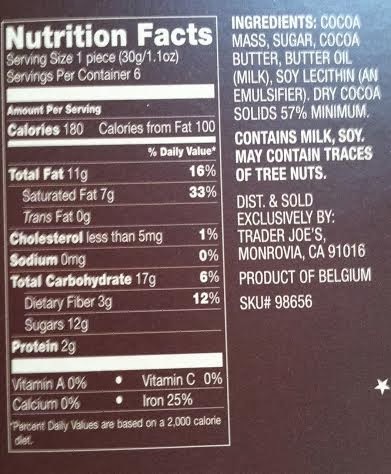 First of all, this is "Belgian" dark chocolate. How's that different from regular dark chocolate? Going into the purchase, I couldn't tell you, but the fact it said "Belgian" made it sound much, much cooler. 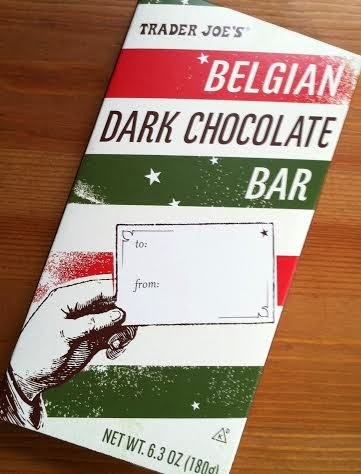 Then there's also Thing on the label, holding that To/From gift tag, implying this is one serious present-worthy chocolate bar. Welllllll....I'm not saying it's a bad dark chocolate bar. It's pretty decent, actually. 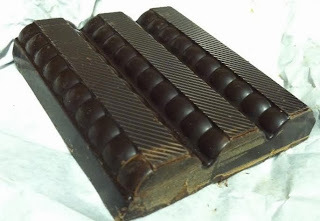 Think of a good, dark but not crazy-dark chocolate bar, and you'll have this. But there's the point. Perhaps it's my complete lack of Belgian cultural awareness outside of pricey Trappist beers and classic cinema, but I can't tell you what makes this different and/or sets it apart from, say, a Hershey bar made in the good U.S. of A. I'm aware of the fact that the package says it is made in Belgium, which as my wife strained greatly to point out to me, makes it a "Belgian" bar, but I wanted to know what made it Belgian, if you know what I mean. The package isn't even the colors of the Belgian flag. Maybe one or two of you kindhearted, patient souls can out there can point me in the right direction. Regardless, it's one thick, hefty bar that made out of six segmented logs (so it's only half the bar pictured). It's not easy to bust them apart - Sandy accidentally thwacked it off the kitchen table and it merely, begrudgingly, broke in half. If you had to build a house out of chocolate, they'd be a pretty good exterior wall. Yet at the same time, they're not too cumbersome for biting and chewing. Must be some of that chocolately melt in your mouth, not in your hand magic. I'm pretty sure I paid two bucks for it at the local TJ's shop. I'd gladly enough pay another two bucks for it again, if they didn't have one or two of our other favorites readily available and I really needed that chocolate fix. My beloved wifey deems it worthy a four. I'm a little behind that.